This book explores the rise of private arbitration in religious and other values-oriented communities, and it argues that secular societies should use secular legal frameworks to facilitate, enforce, and also regulate religious arbitration. It covers the history of religious arbitration; the kinds of faith-based dispute resolution models currently in use; how the law should perceive them; and what the role of religious arbitration in the United States should be. Part One examines why religious individuals and communities are increasingly turning to private faith-based dispute resolution to arbitrate their litigious disputes. It focuses on why religious communities feel disenfranchised from secular law, and particularly secular family law. Part Two looks at why American law is so comfortable with faith-based arbitration, given its penchant for enabling parties to order their relationships and resolve their disputes using norms and values that are often different from and sometimes opposed to secular standards. Part Three weighs the proper procedural, jurisdictional, and contractual limits of arbitration generally, and of religious arbitration particularly. It identifies and explains the reasonable limitations on religious arbitration. Part Four examines whether secular societies should facilitate effective, legally enforceable religious dispute resolution, and it argues that religious arbitration is not only good for the religious community itself, but that having many different avenues for faith-based arbitration which are properly limited is good for any vibrant pluralistic democracy inhabited by diverse faith groups. The management of religious and ideological diversity remains a key challenge of our time, deeply entangled with debates about the nature of liberal democracy, equality, social cohesion, minorities and nationalism, foreign policy and even terrorism. This book explores this challenge at the level of the workplace in Europe. People do not surrender their religion of belief at the gates of the workplace, nor should they be required to do so. But what are the limits of accommodating religious belief in the work place, particularly when it clashes with other fundamental rights and freedoms? Using a comparative and socio-legal approach that emphasises the practical role of human rights, anti-discrimination and employment protection, this book argues for an enforceable right to reasonable accommodation on the grounds of religion or belief in the workplaces in Europe. In so doing, it draws on the case law of Europe’s two supranational courts, three country studies–Belgium, the Netherlands and the UK–as well as developments in the US and Canada. By offering the first book-length treatment of the issue, it will be of significant interest to academics, policy-makers and students interested in a deeper understanding of European and Western inclusion, freedom and equality in a multicultural context. As a young woman in 1968, American Wallis Wilde-Menozzi moved to Rome, leaving behind a troubled first marriage and a tenured faculty position in the UK. In The Other Side of the Tiber, she reflects upon that experience and the decades that followed, in which she developed as a writer, married again and raised a family, and became acculturated to her new home. Her metaphor for remembering is the Tiber, the river that runs through Rome, carrying with it the residue of earlier times and civilizations. Like the river, she writes, one’s memories are always a fluid part of one’s present. The book is not only a personal memoir, though. A major theme is the contrast between the American and Italian ways of doing things–between a Protestant, progressive, rule-of-law society that exalts individualism and looks relentlessly to the future, and a Catholic, traditional one that rejects the idea that people can disregard the past and create their own identities. (“There is no such thing. We are always accompanied by ancestors.”) Each way has advantages and disadvantages. Americans are often shocked by what they see as the casual lawlessness of Italian life–“there is a breathtaking gap,” she writes–“a metaphysical canyon, between what is considered moral and what is considered legal in Italy”–which, no doubt, contributes to economic and political stagnation. On the other hand, there are qualities of community and public forgiveness to compensate. Italians are dismayed by American free-market economics, which often seem heartless and uncivilized, and by Americans’ lack of real appreciation for history. One of the most interesting episodes in the book is Wilde-Menozzi’s account of teaching American students in Siena. The students seem unaware of even the recent history of their own country, to say nothing of the ancients. She attributes their ignorance to the cost, and emptiness, of higher education in the US. 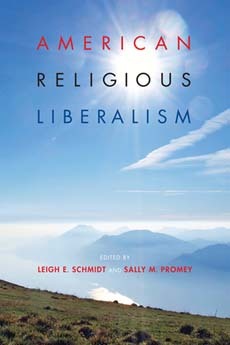 Last month, Indiana University Press published American Religious Liberalism edited by Leigh E. Schmidt (Washington University in St. Louis) and Sally M. Promey (Yale University). The publisher’s description follows. Religious liberalism in America has often been equated with an ecumenical Protestant establishment. By contrast, American Religious Liberalism draws attention to the broad diversity of liberal cultures that shapes America’s religious movements. The essays gathered here push beyond familiar tropes and boundaries to interrogate religious liberalism’s dense cultural leanings by looking at spirituality in the arts, the politics and piety of religious cosmopolitanism, and the interaction between liberal religion and liberal secularism. Readers will find a kaleidoscopic view of many of the progressive strands of America’s religious past and present in this richly provocative volume.